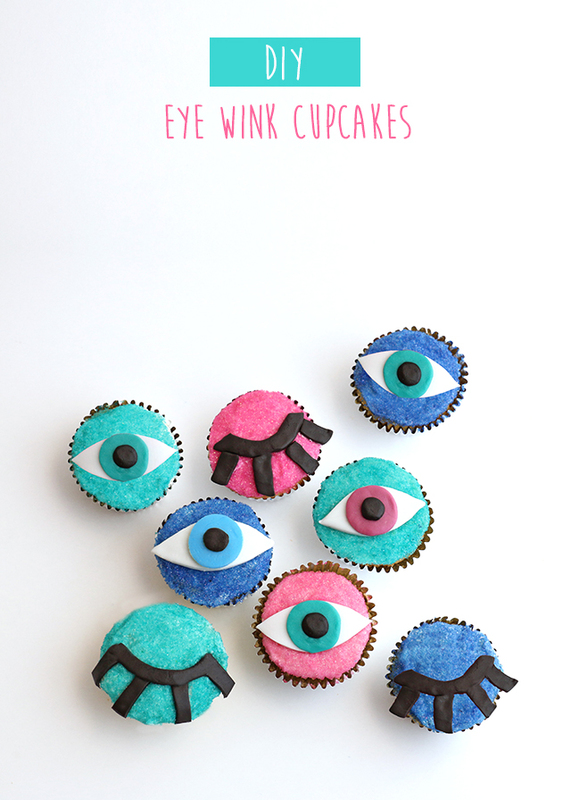 I loved the DIY Eye Ornaments that A Beautiful Mess posted so much that I decided to make some cupcakes with similar eye and winking pieces that the awesome ABM ladies had painted onto their ornaments. 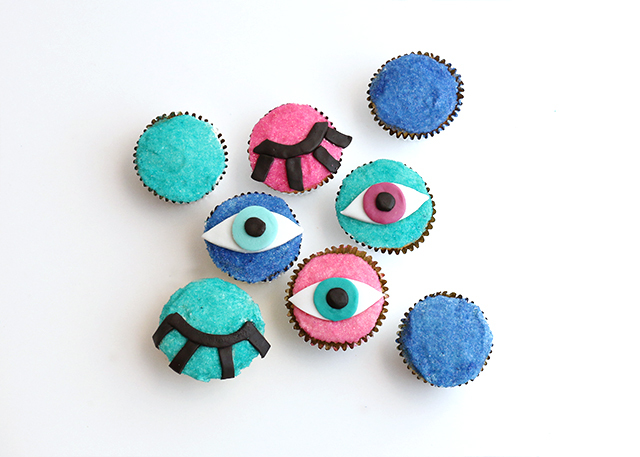 These guys kind of remind me of monsters but still look cool, especially when topped on some brightly colored cupcakes…at least eye think so! (oh my gosh, get it?!) Get the directions with step-by-step photos after the jump! Step #1: First pour some sanding sugar onto a plate (1 color per plate). 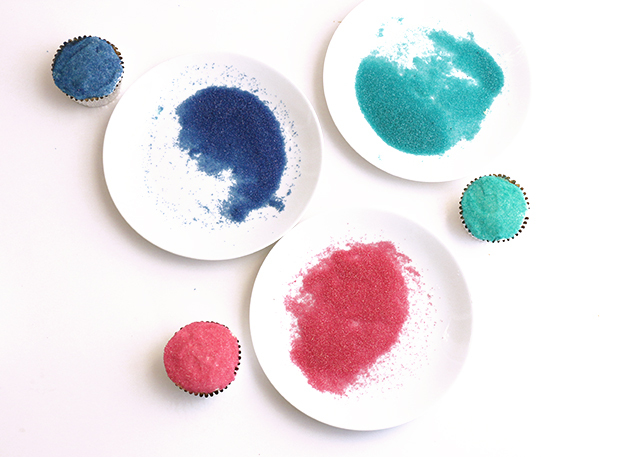 You can choose to use one color of sanding sugar or a variety of colors, totally up to you. As you can see, I went with 3 colors – a turquoise, a pink, and a blue. 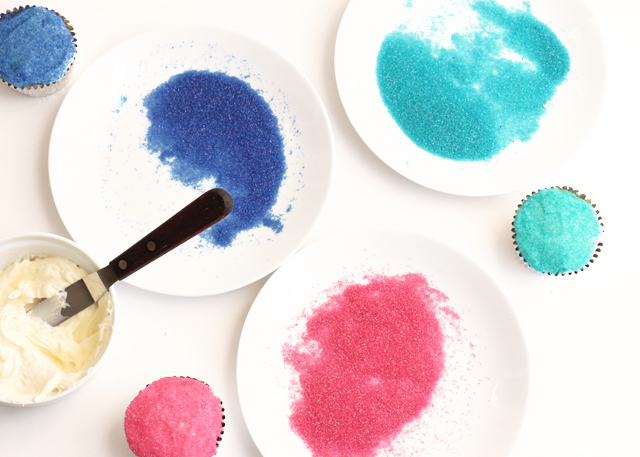 Lightly frost each cupcake with vanilla buttercream using your spatula and then gently roll the top of the cupcake into the sanding sugar to cover the frosting. Set in the fridge to allow the sanding sugar to set into the frosting before you continue. Step #3: Below you’ll find what’s needed to mold and cut from the modeling chocolate/fondant for each of the eye and wink pieces. 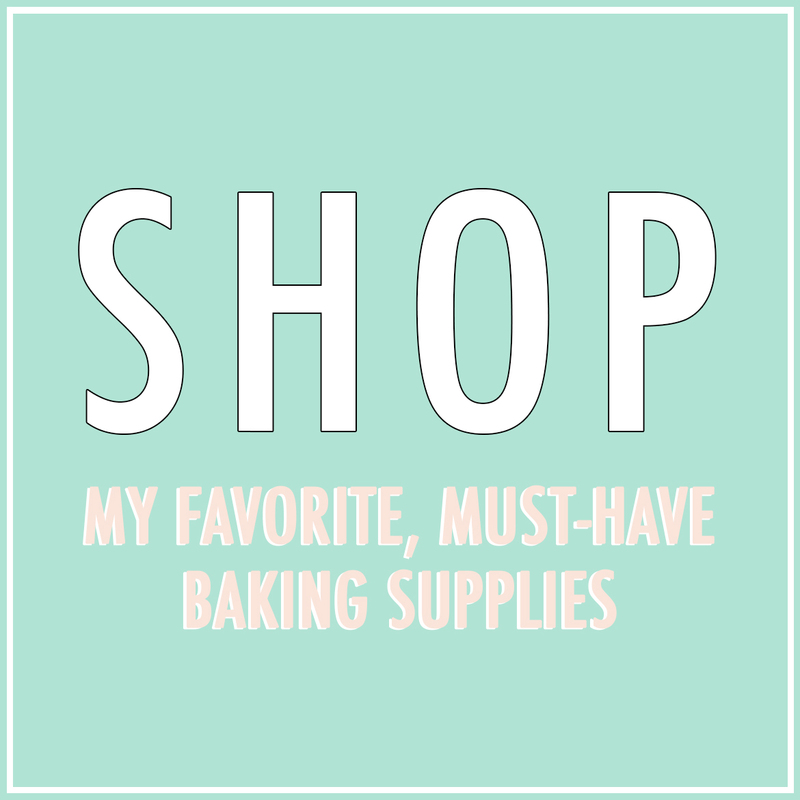 For all of this molding and cutting, make sure to work on wax paper or a silicone mat. If your fondant or chocolate gets too sticky, work in some confectioner’s sugar. Eye: Using your plastic rolling pin, roll out a small ball of white into a rectangular shape. Use your knife to cut the oval / evil eye shape. You can print a template to use from your computer, but I just winged mine. Using a template will also ensure all your eyes are the same size, in case you’re looking for perfection. 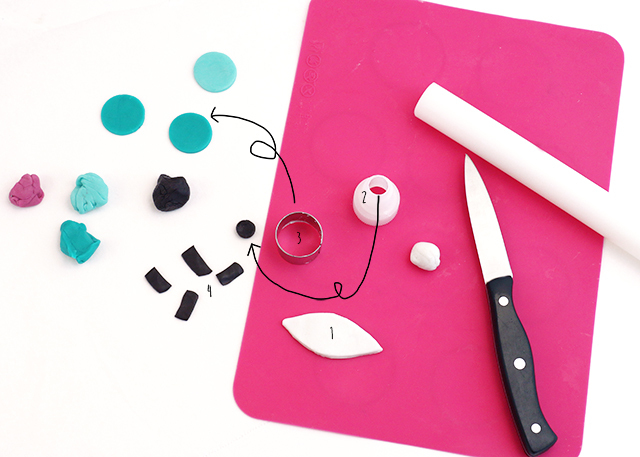 Pupil: Using a small (about 1/4-inch) cookie cutter or anything you can use as a cookie cutter, like a piping bag tip! If you can’t find anything, you can also just shape by hand! Iris: I chose to make 3 different colors for my iris eye pieces. Whether you use a variety colors or just one, roll out the dyed fondant and then use a small round (3/4 to 1-inch) cookie cutter. Again, feel free to shape by hand if you don’t have a cookie cutter. 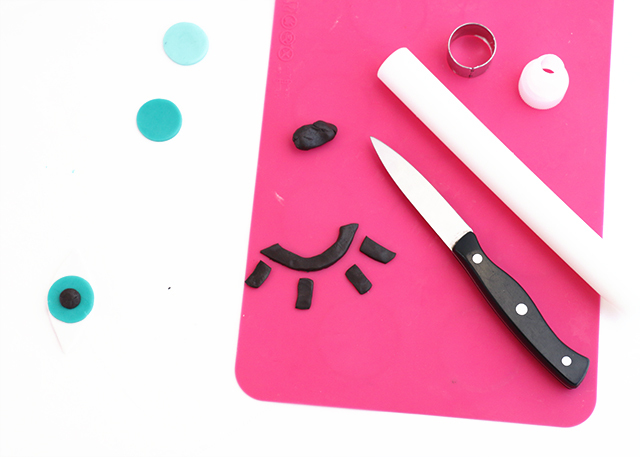 Wink: For the wink, roll out your black fondant. Using a knife cut out 4 lashes and one thin, semi-circular strip. 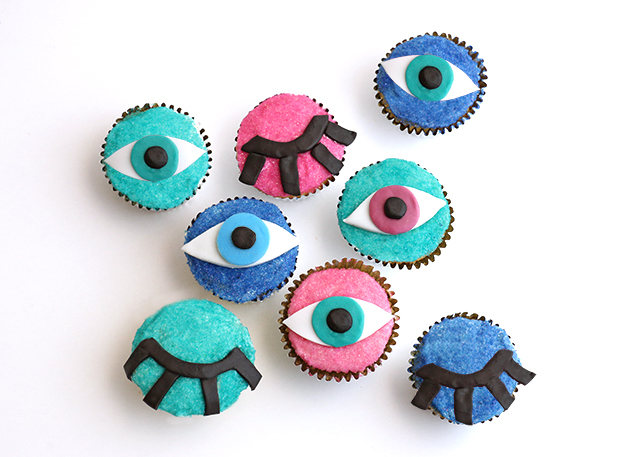 Step #4: For the eyes, use a tiny dab of leftover buttercream in between each piece and assemble them by placing the eye shape atop the cupcake (making sure to add a little buttercream to the bottom of the piece prior to adding), followed by the iris, and then the pupil. For the wink, I added the semi-circular strip first and then added each lash, again using buttercream as a “glue” to adhere them to each cupcake.